Sometimes it’s not easy to be a nice person. What I mean is, it seems like the nicer and more generous a person is, the worse they seem to be treated. When a person is selfish and mean, people seem to not only treat them well, but people make all kinds of excuses for their bad behavior. I was at the movies yesterday and I saw a preview for a new suspense film called, “No Good Deed”. It was about a married woman, played by Taraji P. Henson, who seemed to have a pretty nice life. She had a husband and 2 small children and a beautiful home. Sometimes you can just find yourself in the wrong place at the wrong time. Unfortunately, when the wrong place is your sanctuary called home, a seemingly good situation can turn bad really quickly. The sad thing is, when a person is genuinely nice, they can sometimes be caught off guard by people with ulterior motives. During a regular evening while the character played by Taraji was home spending time with the kids, there was a knock at the door. A man, played by Edris Elba, stated that he had been in an accident and he appeared injured. The happy mother of 2, showing genuine concern, asked if he was ok. He asked if he could use her phone. She hesitantly told him yes and asked him to wait while she went to get it. Unfortunately, the man saw this as an opportunity to victimize an innocent family. Honestly, it seems like nice people are targeted because they are vulnerable and easy to manipulate. The title of the movie really caught my attention and although I’ve heard this term before, this was the first time I ever thought about it in this way. The complete statement reads, “No Good Deed Goes Unpunished.” This is the best and worst example of an oxymoron that I’ve ever heard. 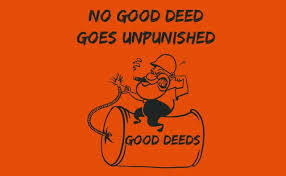 When I think of someone doing a good deed, I feel that they should be rewarded not condemned or victimized. Unfortunately, many times, bad things happen to genuinely good people and there’s no logical explanation for it. At some point a person starts to feel resentful when they have a good heart and it always seems like they are being taken advantage of in some way. The bible tells us in Galatians 6:9-And let us not be weary in well doing: for in due season we shall reap, if we faint not. The blessing in this verse is that God sees and knows all and because of our good deeds, we store up blessings in reserve. We never know how we are going to be blessed. God can bless us through our children. He can spare us in a dangerous situation. There are so many ways that he watches over us and therefore we must continue to be the people that we were designed to be.